We party sometimes or just hang out in our hostel bar (Rooftop in the Summer, Old Wagon in Winter). No agenda, No American standards. Just respect and good vibes. . So if you are just looking for a bed to have a good sleep this might no be the place for you. But if you are interested in exploring the yet un-gentrified part of Tel Aviv and Jaffa, Overstay is a good base with (relative to israel) cheap beer and vibes. Overstay is a hostel and home for arts, alternative happenings and meeting people from all over the world. Located in a former factory in an industrial area within 10 minutes walk to the Beach, Old Jaffa, Flea Market & Florentine,the hipster capital. It is a very good location if you like alternative upcoming vibe, it isnt if you are the kind that like tourist traps and city centers. But all that is just 25 minute walk from here. The Overstay is a massive ship sailing the concrete jungle of south tel aviv, an oasis in the urban Jaffa. Just out our front door is the 18th century Ottoman Abu Nabut Tomb set to provide water to the convoys heading from Jaffa port to Jerusalem. The Overstay itself resides in a former textile factory located just off the historic border of the first Tel Aviv neighborhoods and Old Jaffa. We built it with our own hands and work on it everyday to make it nicer and more fun. We have both a rooftop sea breeze sun deck upstair (summer time) and in the winter the bar is in an old wagon in the yard. 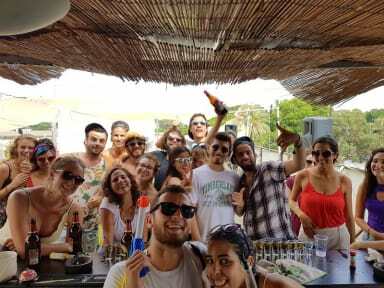 We like to chill out and party, and aim to provide the perfect conditions for young open minded tourists and backpackers to relax and meet fellow travelers, make new friends with which to head out and enjoy what Mediterranean Tel Aviv has to offer. Passport with valid visa is a must , this is strictly a tourist hostel. Awesome place! Everyone is so friendly and the staff does a great job with everyone. There’s always fun activities going on in the bar which made it so easy to meet other guests. Would highly recommend this hostel to any traveler going to Tel Aviv! The hostel is located right outside all the good places to go so walking to places is not hard at all as long as you enjoy a 10 minute walk:) definitely check it out! I stayed in the Overstay Hostel only for two nights and I felt at home very quickly. People as well as the staff have been very welcoming. The beds were okay as well as sanitary stuff. When it comes to the Location you should be okay with About 15 to 20 minutes walking distances to get to the beach or the market. But the old town is very close. Thanks a lot for the easy going atmosphere, I am super happy that I stayed at this place! Young hostel with plenty of character, but in an unwelcoming area. its the cheapes one alright. you get what you pay for. the esentials are all there. staff is ok mostly voleteers. our door didnt lock from the inside. the brakfast is basic but ok to fill you up until lunch. youve got a couple of places to chill etc and the beer is cheapar than in a baar. the location is not ideal as you godda walk at least 10 mins to get to any intresting place. and the city center is more like 30 min walk. facilities work and are sorta clean. If all you need is a clean bed to crash on, this will work. If, however, you want a fun atmosphere to meet new people and appreciate a quality social experience, I'd pay the little bit extra for a different place. Hostel looks very nice. Especially the bar in the caravan I found enjoyable. The staff was not very friendly. The volunteers were mostly among themselves, this way it feels the hostel is more for them than for its guests. I also didn't like the number of signs everwhere explaining the rules. It doesn't make you feel very welcome. Besides that all good. The hostel s quite spaceous and has a lot of art and interesting things spread around. The staff consists of mostly volunteers who in most cases are new to the city of Tel aviv and seem to spend little time outside of the hostel and are not very helpful when it comes to answering questions. The place could use some serious maintenance and cleaning. Small breakfast included is a nice plus.